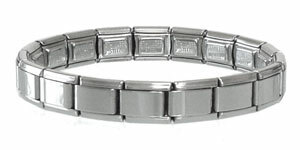 Shiny stainless steel, magnetic Italian charm bracelet for modular jewelry. Round magnets are inserted in every links of stainless steel bracelets. Magnetic therapy is a natural way to treat a wide variety of ailments in both humans and animals. It is 100% safe, drug free and has no side effects. Magnet therapy works well as a therapy alone or in-conjunction with both natural and conventional therapies. Small high strength healing earth magnets are placed on the body as close to the point of pain as possible. Magnetic therapy can be applied in the form of straps, wraps, jewellery, insoles, pillows, mattress covers. Magnet therapy has been around since 2000 BC and has its roots in Chinese medicine it has been used in China along side Acupuncture and Reflexology for thousands of years.